Bwahaha @Snowden shut it. That's great. No question Snowden was flipped and/or a "white hat". Because it's not a slogan it's an idea. That's what starts revolutions. Who's idea was it? The saying comes from JFK, who picked it up somewhere else. Ok, let's go with that. It's a saying. WHAT picture is Fake? I don't see a photo on 1062. The picture is the text above the Q post. 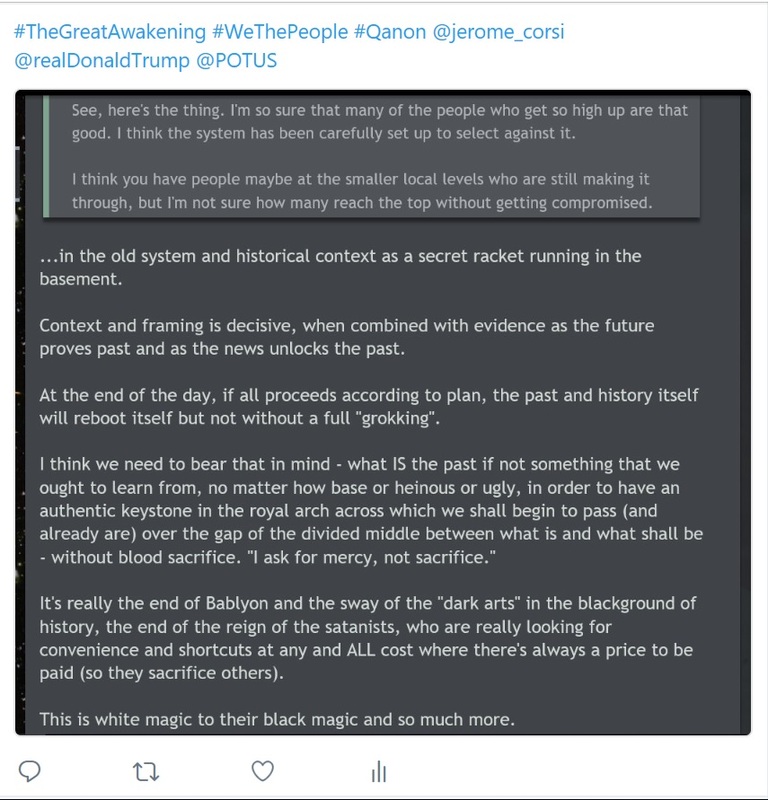 The post above Q's post is the picture. Q verified that particular post is fake. No, Open the door. @Snowden close to it. We have seen some signs that @Snowden has been turned and is a white hat, although it appears that Q needed to freak him out and scare the # out of him to win his cooperation (the way I've seen it unfold). So I therefore interpret it as a command to Snowden to open the door. It's probably designed to scare the # out of certain enemies ie: what are Q and Snowden up to, what do they know and can access, etc? Btw, is Assange's internet back up and running yet? Please feel free to RT like or comment. Can't see it in that pic but I was sure to include a link to this thread. Thank-you. That explains why there are no Nov 8, 2017 posts @ qanon.pub... Anonymous must have had asking Q about that post in his "things to do" list, and asked about it today.